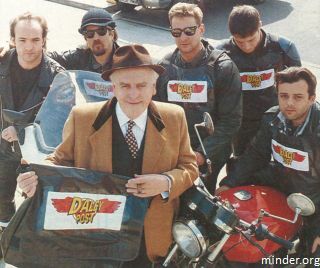 I've always been a fan of this one with Arthur running a courier service 'The Daley Post' around London with Morley hot on his tail for an arrest. Arthur interviewing potential staff at the car lot is great and just shows how inept some young people can be in this sort of situation plus how Arthur is clearly full of his own ideas. We are soon into 'The Daley Post' and 'Ralphy & Keef' aka 'The Warnock Brothers' turn up and try to hand Arthur's venture a lot of dodgy business. Ray's first client 'Laura Kaye Models' are also getting aggro from an over enthusiastic nutter called Conway, desperate for a set of photos of June Grainger - given to and misplaced by Arthur's new venture. This leads to a very good scene between Arthur, Conway and the unexpected arrival of Jehovah's Witnesses with whom Arthur has no qualms about listening in order to save his own skin until Ray arrives. According to the some production info I have on this one, this episode was originally entitled 'Close Encounters Of The Worst Kind'. Filming dates for this one are a bit confusing based on the clues - it could be between 19 March 1992 and 20 June 1992 as there is a brief glimpse of 'Some Like It Hot' at The Prince Edward Theatre behind Gary Webster as he goes looking for clients - this production was showing there between these dates. Also, unless it is a prop, towards the end there a clear shot of a 'Daley Into Europe' calendar on the wall of the lockup which based on the dates and days shown could be August 1992, I am just not entirely sure what the week numbers 49, 50, 51, 52 mean on this - perhaps the end of Arthur's financial year? This is why I am inclined to think this is a made up calendar. This isn't the funniest of episodes but it is a decent script and has some great characters - firstly in the form of some excellent acting from Brian Hibbard as 'Rabbit' (complete with Iron Maiden and Aerosmith t-shirts). Also, say what you like about Elaine Lordan as 'Trish' - personally I think she is absolutely brilliant in this episode as the fiery radio controller in charge of the couriers. With these characters, dodgy geezers in the form of the Warnock brothers, bent tickets, Morley and Field trying to work it all out, a nice punch from Ray, a tasty lady in the form of Sara Stewart and a visit from the taxman at the end, this is a very good effort overall! Don't hang about Dave, wet the glasswear! Ours but to push on and harvest the readies! It's not often that one gets to chew the theological fat, so to speak. Bibles, flood damaged - I thought that was a nice authentic touch. Yeah this is a great episode. I love Arthurs line to Rabbit. "You might be the longest surviving dispatch rider in London but only the favoured few step foot in the inner sanctum. Got it it Rabbit? Good, now hop it!" I gave this a watch this afternoon and have to agree with the above posts, a cracking little episode. Brian Hibbard was a good actor and plays his part well in this, also the girl from Eastenders also down her part justice, plays the radio operator brilliantly and gets the lads hot under the collar down the Winxhester. Good small role for Reg from 'Goodnight Sweetheart' as one of the jehovas witnesses who come to Arthurs rescue. I am three episodes in and have enjoyed them very much, Ray Daley is growing into the role. I just find it hard to believe it is 25 years this year since the first RD series began, frightening. This is my favorite Ray years episode, I love Brian Hibbard he fits the role so well he was also great in the film twin town, he also had a part in a welsh language soap and as always played the part a 100%. This episode had a lot going on with many shady characters to make for interesting viewing. I do prefer the earlier Terry episodes like I've said before, but I do like the Ray years as well there were some really good episodes. It's a shame Brian is no longer with us such a great talent I hope George and Brian are in that Winchester in the sky having a large vat all around. That was a fun and entertaining episode. I'm three episodes into Series Nine and it is a vast improvement over the previous one. Gary is settled by this point, a great episode with an early 90s vibe in epic proportions. Glad you're liking the 9th series pr1. I'm definitely enjoying Series Nine. The kinks associated with the introduction of Ray seemed to have all been worked out and Minder has returned to form. Another strong episode. George Cole stealing everyone's thunder. Love the scene with the Jehovah's witnesses and Arthur trying to sell flood damaged bibles to them. Yes I totally agree, Brian Hibbard suited the part.